L.A. Noire puts you face to face with virtual suspects that you'll believe are real. Rockstar brought a brand new demo of L.A. Noire to PAX East 2011 that exposed the unique, and sometimes gruesome, aspects of the game. While it has an open world like previous Rockstar efforts, L.A Noire is certainly not Grand Theft Auto played from the perspective of a police officer. First of all, L.A. Noire is a very serious game. Rockstar says that the game has its share of lighter elements, but overall it wouldn't make sense for L.A Noire to be goofy due to the subject matter involved, which often revolves around brutal murders and other crimes. Speaking of brutal murders, Rockstar showed off a case from the homicide desk called the "Red Lipstick Murder." At the start, the case opens with a noir-style vignette showing the murder being committed by a silhouette (with a little bit of Sin City's style in there through spurting blood), and then the scene switches to the police station. Cole, the game's main character, is promoted to homicide detective, given the case and a new partner (partners will vary by case desk), and sent on his way. The obvious first location Cole visits is the scene of the crime to investigate and speak with the coroner. However, L.A. Noire's investigation goes more in depth than just walking around, picking up matchbooks, and examining footprints. 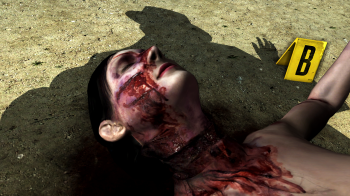 For this case, players actually get hands-on with the dead body of a completely naked female, examining her nasty head wound, the damage to her hands, and any other "points of interest" that relate to the crime. Once the cause of death has been determined, players search for evidence in the general area around the body. 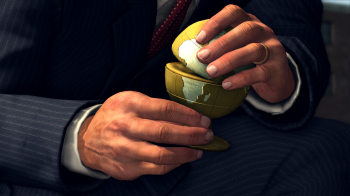 Cole finds a small globe, which the player must rotate in a mini-puzzle to open it up and reveal the address of a bar. Off to the bar, then. In the bar, a reluctant bartender and regular are questioned. This is where L.A. Noire's innovative motion capture system really shines. It honestly made the story scenes more realistic than anything I've seen before, but when the actors are zoomed in on you can really tell if they're lying, trying to hide something, or just acting weird because of minute facial ticks, eye movement, and more. It's all very subtle too, which makes the effect even more impressive. The bartender was obviously annoyed with police questioning, but didn't appear to be lying, while the regular definitely had something to hide. Interrogation isn't complicated, but players have to use a notebook that gradually gets filled with evidence to their advantage. While questioning a suspect, players can choose to believe a statement, doubt it, or outright accuse the person of lying. Some suspects might ask Cole to backup his accusations with a piece of evidence in the notebook. Rockstar revealed that you cannot fail a case, but the way that you reach its end will be very different depending on your accuracy and investigative skills, so there's a lot of variety. The game shows players what they got right and what they got wrong after an interrogation and awards experience points accordingly, which will cause players to rank up and give them intuition points that make interrogations easier. Cole squeezed the address of the murdered woman's ex-husband out of the man at the bar, and took off. You can drive around L.A. Noire's 8 square miles of 1947 Los Angeles yourself, or you can have your partner take the wheel if you feel lazy. Rockstar said that the game definitely has the open world that fans are accustomed to from previous titles, but it isn't quite as crazy with random quests or pizza delivery missions. Side cases will pop up on the radio at times, but everything will make sense for a police officer of the era. At the ex-husband's house, Cole enters with gun drawn. The owner was home, and he's informed of his potential future arrest for murder while Cole explores the house for damning evidence. As players explore, a piano chime will play that indicates a something is nearby to check out. Not everything is important, because that'd be too easy, so players have to determine what matters and what doesn't. Thankfully, Rockstar has implemented what it calls "investigation music" which will stop playing when there's nothing left to find, so you won't wander around an apartment endlessly for no reason. Cole finds a pad of paper and does a pencil rubbing, uncovering the words of a note previously written by the ex-husband saying he had to "do something about his wife." However, while interrogating the man, his face seemed to show that he knew something, but he didn't appear to be the killer. You could really tell this from his face. Cole uses the pad of paper to catch the man in a lie, and it's revealed that he had someone else perform the murder for him. Grand Theft Auto was Rockstar's innovative open world game, Red Dead Redemption was an innovative western, and L.A. Noire is set to be an innovative experience as a police officer from the 1940s with a realistic bent. Cole will experience a wide variety of cases as he moves from the traffic desk, to homicide, and beyond. If the entire game plays out like this single case shown at PAX East 2011, L.A. Noire will be one impressive game.